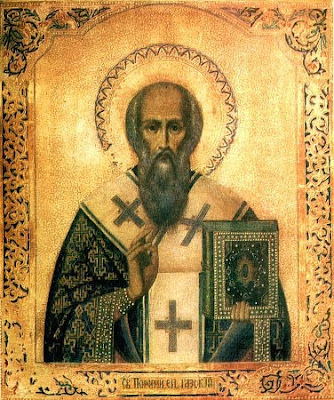 Saint Porphyrios, Bishop of Gaza, was born in about the year 346 at Thessalonika in Macedonia. His parents were people of substance, and this allowed Saint Porphyrios to receive a fine education. Having the inclination for monastic life, at twelve years of age he left his native region and set off to Egypt, where he was an ascetic in the Nitrian desert under the guidance of the monk Makarios the Great (19 January). There also he met Blessed Jerome (15 June), who was then visiting the Egyptian monasteries; he set off with him to Jerusalem on pilgrimage to the holy places and to reverence the Life-Creating Cross of the Lord (14 September), after which he resettled into the Jordanian wilderness for prayer and ascetic deeds. There Saint Porphyrios fell under a serious malady of paralysis. Unable to walk, he would have to crawl to the divine services. For healing he decided to go to the holy places of Jerusalem. One time, when fully paralysed, as he lay half-conscious at the foot of Golgotha, the Lord sent His servant into a salvific vision in his sleep. Saint Porphyrios beheld Jesus Christ, descending with the Cross and turning to him with the words: "Take this Wood and preserve it". Awakening, he sensed himself healthy. The words of the Savior were soon fulfilled: the Patriarch of Jerusalem ordained Saint Porphyrios to the priestly dignity and appointed him curator of the Venerable Wood of the Cross of the Lord. And it was during this time that Saint Porphyrios received his portion of an inheritance from his parents – four thousand gold coins. All this he gave away to the needy and for the embellishing of the churches of God. In 395 the bishop of the city of Gaza (in Palestine) died. The local Christians set out to Caesarea to Metropolitan John with a request to provide them a new bishop, who would be able to contend against the pagans, which were predominant in their city and were harassing the Christians there. The Lord inspired the Metropolitan to summon the Jerusalem presbyter Porphyrios. With fear and trembling the ascetic accepted the dignity of bishop, and with tears he prostrated himself before the Life-Creating Wood and then set off to fulfill his new obedience. In Gaza he found all of only three Christian churches, but of the pagan temples and idols there were a great many. During this time there had occurred a long spell without rain, causing a severe drought. The pagan priests brought offerings to their idols, but the woes did not cease. Saint Porphyrios imposed a fast for all the Christians; he then had the all-night vigil, followed by going around all the city in a church procession. Immediately the sky covered over with storm clouds, thunder boomed, and abundant rains poured down. Seeing this miracle, many a pagan cried out: "Christ is indeed the One True God!" As a result of this, there came to be united to the Church through Holy Baptism 127 men, 35 women and 14 children, and soon after this, another 110 men. But the pagans just like before still harassed the Christians, passed them over for public office, and burdened them down with taxes. 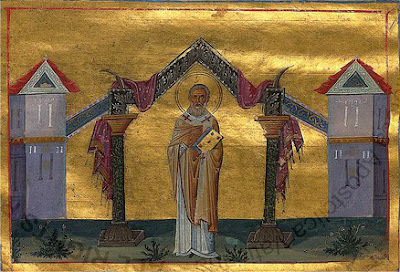 Saint Porphyrios and the Metropolitan of Caesarea John set off to Constantinople, to seek redress from the emperor. Saint John Chrysostom (14 November, 27 and 30 January) received them and rendered them active assistance. Saints John and Porphyrios were presented to the empress Eudoxia who at that time was expecting a child. "Intercede for us," – said the bishops to the empress, – "and the Lord will send thee a son, who shalt reign during thine lifetime." Eudoxia very much wanted a son, since she had given birth only to daughters. And actually through the prayer of the saints an heir was born to the imperial family. In consequence of this, the emperor in the year 401 issued an edict directing the destruction of the pagan temples in Gaza and the restoration of privileges to Christians. Moreover, the emperor bestowed on the saints the means for the construction of a new church, which was to be built in Gaza on the locale of the chief pagan temple there. Saint Porphyrios to the very end of his life upheld Christianity in Gaza and guarded well his flock from the vexatious pagans. Through the prayers of the saint there occurred numerous miracles and healings. Over the course of 25 years the archpastor guided his veritable flock and reposed at an advanced age, in the year 420. Yesterday thus and today otherwise! Of the rare physician, tell me the name." And on the other cross, the thief. In Your kingdom, remember me! Lifted the Cross and, on me He placed it. To Christ my Savior, glory be!" The truth of things hath revealed thee to thy flock as a rule of faith, an icon of meekness, and a teacher of temperance; for this cause, thou hast achieved the heights by humility, riches by poverty. O Father and Hierarch Porphyrios, intercede with Christ God that our souls be saved.